It's no coincidence that Send Her Victorious 'do' a higher percentage of shows featuring classic cars than anything else, you see we have a little bit of petrol running through our veins, so as with many things in life, we are drawn to places where we can selfishly indulge our interests (as well as meeting great people and hopefully offering wonderful products!). Way before project 'Send' began we have owned and run a few old bangers, mostly it has to be said were common British cars from the 70's, by this we mean Mini's, Morris Minors etc. - This is the car group commonly called 'Everyman Classics'. One of the things we have noticed is that the accessories for this market are pretty poor, of course you can get a nylon embroidered bag from a well known internet auction site for a few quid, or at the other extreme you can buy exquisite leather baggage costing in excess of £300 (providing you have an Aston Martin or a Bugatti) - but what about the middle ground where most of us sit, well our research came up with zip, nada, nothing, or to coin a new word 'kall. .............. & Send HIM Victorious was born. We commissioned our good friends at Janes Design (www.janesdesign.co.uk) to produce a new logo to appear on all our 'own manufactured' products and this is how it looks as an embroidery on the Everyman bags. Some of you may notice the inspiration drawn from the great Monaco poster artist Geo Ham (his artwork is another little passion of ours! ), we also think it works nicely with the classic Send Her logo - Maybe a bit of a Barbie & Ken thing going on here? But hey, it's up to you the customer to judge us. There's the background, let's get to the point......What exactly does Send Him Victorious do that's different to Send Her? All products designed and manufactured by us bear the Send Him label. The first range that we are producing is weekend bags celebrating the Everyman classic cars of the 70's, filling the gap that we identified for good quality, reasonably priced products for this particular market. The Mini Cooper bag is already available and can be purchased from this site or via selected stockists, this will be followed closely by a BMC Rosette, Jaguar and Morris bags. As existing customers will know, we concentrate on quality goods at realistic prices and this will be a central tenet of Send Him Victorious. 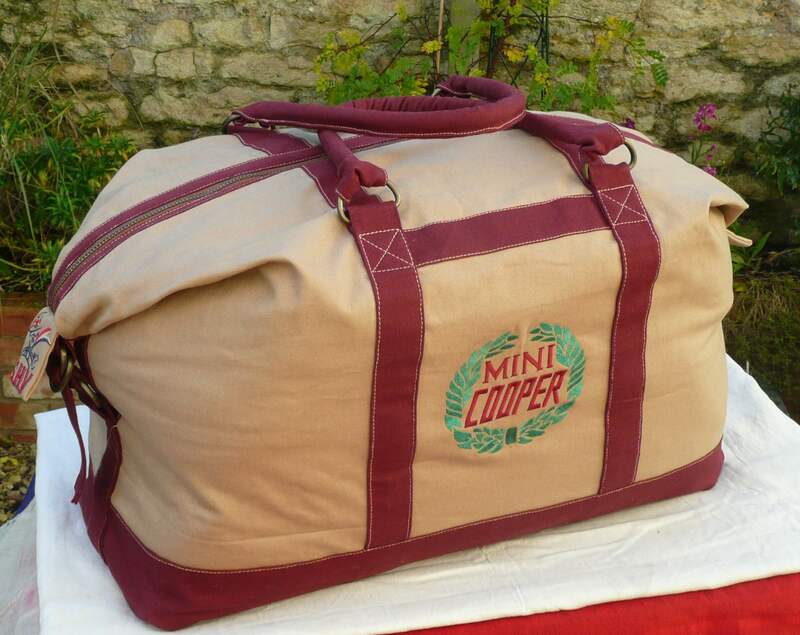 The Mini Cooper Everyman bag - available to buy on this site - now. (£75.00). These bags are manufactured from 100% hard-wearing Cotton duck fabric. With a removable baseboard they are fully washable (dirty weekend?). The soft cotton used means that when empty they can be squashed flat for easy stowage. Special wholesale rates are availble for retailers or car clubs - please send us an email to enquire. Welcome to our website. Have a look around. We're sure you'll find something you like. Our latest news and promotions. See pictures from previous shows and some of our products in use. Find out a little bit more about us, why we're here, and what we do. Have a question or enquiry? Please don't hesitate to get in touch. Copyright© 2019, Send Her Victorious. All Rights Reserved.